As Sloane eagerly waits for the barricades to fall, she’s forced to witness the apocalypse through the eyes of five people who actually want to live. But as the days crawl by, the motivations for survival change in startling ways and soon the group’s fate is determined less and less by what’s happening outside and more and more by the unpredictable and violent bids for life—and death—inside. When everything is gone, what do you hold on to? I’ve said it before and I will say it again, Courtney Summers is an absolute goddess and the complete queen of my bookshelf. I fell in love with her work last year when I read All The Rage, a book that tore my heart and soul to shreds. Her writing never ceases to amaze me in the powerful message that it carries – and This Is Not A Test is no exception. While reading the synopsis might make you uneasy and question how a book about zombies can be as hard hitting as I claim it to be, trust me when I say this – This Is Not a Test is so much more than just another book hightailing it through the zombie craze. It is raw, unflinching, and it will make you question everything about what makes us human. Summers has this amazing ability to basically destroy every single plan you’ve made for a day as soon as you read the first page of her books. 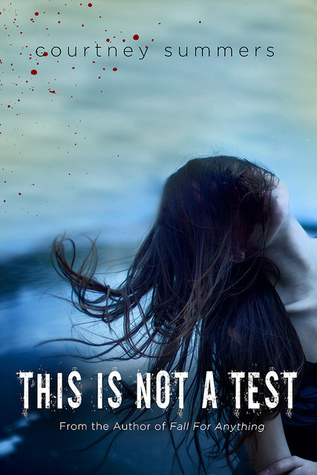 This Is Not A Test completely grabbed me by the throat and dragged me around kicking and screaming right form the first page – I was hooked before I’d even reached chapter one. The opening sequence of this book was intense – there is no other word for it. It doesn’t get any better from there to tell you the truth. We’re thrown straight into this complete chaotic mess of the world, starting with a regular morning in Sloane – our protagonist’s life – and then we’re off to the races as it were. There is no break, no time to catch your breath. While certain scenes might not be physically brutal or taxing, those in between the fights for survival are filled with emotional battles that are almost more intense than the ones against the zombies or even each other. This book… just wow. Sloane. I don’t even know what to say about Sloane. When we first meet her, she has no intention of wanting to live. Her sister abandoned her to an abusive father. The world is ending. She is alone. She wants to die – but she holds on. She holds on despite her best efforts to have it end any other way than with her own survival. It was a very strange, eye opening experience – reading a book from the point of view from someone that doesn’t even want to be there. I am so used to a strong, badass heroine doing everything in their power to keep on kicking – and Sloane was the complete opposite. She is still badass, ruthless, and utterly compelling – but for entirely different reasons. She will make you think. She will make you question everything you’ve ever thought about what it means to survive. Then there are the other students: Cary, Rhys, Trace, Grace, and Harrison. All of them end up trapped together in the high school. They are together, struggling to survive… and boy, do they add to the story. I think this is part of Summers’ mastery – she has this ability to make supporting characters who are so raw and undeniably essential. We get to know them all. We see them cry, we learn their weakness and their vulnerabilities. They are all simply exposed in this new version of hell. It was heartbreaking. I’m still trying to figure out just how I feel about all of them because they just add so much. They turn an already harrowing scenario into a full throttle mental mine field just waiting to blow up at the slightest provocation. The addition of the supporting characters, and the role each individual plays, really nails down the main question of this book. Who is the real enemy? What if the real enemy is you? Courtney Summers has once again created something worthy of every possible award known to man. This Is Not A Test will make you question everything you think you know about yourself and what you think you are willing to do to survive. This book will rip your chest open and never let the wound close. What are you willing to do to survive and can you live with the answer? This one sounds so great! I am scared of zombies, so I don’t really read many zombie books. I might have to try this one though. I’m glad that the side characters are well fleshed out. I am very tired of flat side characters atm. Ooh, thanks for this review, I’ve just added this to my to-read list on goodreads! It seems really good!